Our ultimate non-iron long-sleeved girls blouses are so convenient; simply wash, hang and dry and you're good to go. 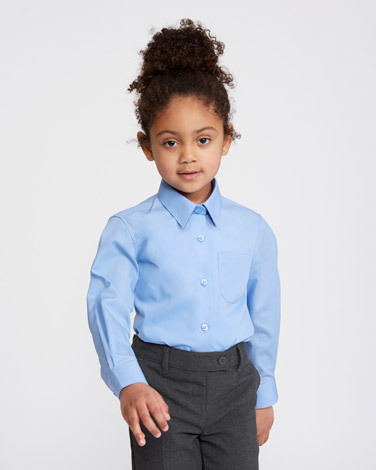 Incorporating stain release technology to help stains wash out more easily, these regular fit blouses also boast expandable cuffs and easy close features (up to age 7-8) to make dressing even simpler. Designed with comfort and practicality in mind, these blouses feature a boned collar and curved hem that will keep your kids looking smart no matter how demanding the school day is. Pack of 2.